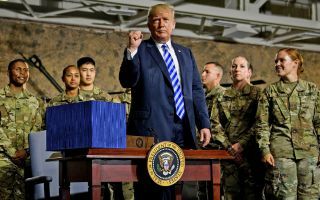 U.S. President Donald Trump stands after signing the John S. McCain National Defense Authorization Act for Fiscal Year 2019 at Fort Drum, New York, on Aug. 13, 2018. President Donald Trump is serious about building a military Space Force. On Monday (Aug. 13), just before signing a sweeping $717 billion defense-authorization act to fund the U.S. military over the next year, Trump took time to argue for the necessity of his proposed U.S. Space Force. Trump signed tthe John S. McCain National Defense Authorization Act in front of a crowd of soldiers, officers and dignitaries at Fort Drum, New York. Every year, the House and Senate pass the National Defense Authorization Act, which authorizes the defense policies that will receive funding, to be set at a later date by the appropriations committees. As required by the Constitution, Congress has to provide for the "common defense," and as Trump excitedly discussed at the signing ceremony, the U.S. common defense may soon include a space-oriented, sixth military branch. "In order to maintain America's military supremacy, we must always be on the cutting edge. That is why we are also proudly reasserting America's legacy of leadership in space," Trump said at the signing ceremony. "Our foreign competitors and adversaries have already begun weaponizing space, developing new technologies to disrupt vital communications [and] blind satellites," Trump said. "We'll be catching [up to] them very shortly. They want to jam transmissions, which threaten our battlefield operations and so many other things. We will be so far ahead of them in a very short period of time, your head will spin." Trump pointed to China, specifically, as a threat to the U.S. space. Vice President Mike Pence also mentioned China, in addition to Russia, as the major threats to U.S. space when he revealed a detailed plan for a Space Force last week. "China even launched a new military division to oversee its war-fighting programs in space, just like the air, the land, the sea — space has become a war-fighting domain," Trump said at the signing today. The president also reasserted the need for "American dominance in space," echoing words he used in June when directing the Department of Defense to form the Space Force. "It is not enough to merely have an American presence in space — we must have American dominance in space," Trump said. "And that is why, just a few days ago, the vice president outlined my administration's plan to create a sixth branch of the United States military, called the United States Space Force." According to the Space Force plan unveiled by Pence last week, the Trump administration is targeting a 2020 rollout for the new military branch, if it is ultimately approved and funded by Congress.